I’ve heard it a million times, and I’m sure you have too. Don’t over-call when you’re turkey hunting. That’s a good tip, but here’s a scenario that leads me to believe at times you need to call according to how the turkeys are responding. After a busy day we made it home, threw on our camo, grabbed the shotgun and decoys and headed to the closest hunting spot. 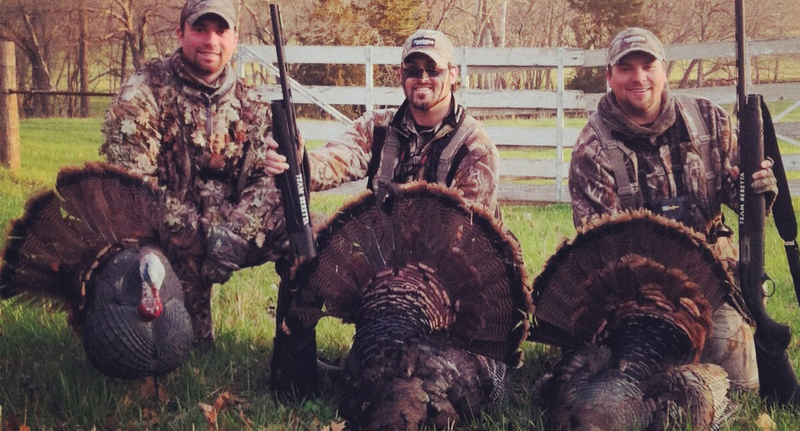 With about three hours of hunting time, we started with some aggressive calling in an attempt to swoon a tom turkey. We started our run, Hank with his Cane Creek Pro Custom Aluminum and me with my Primos “Ol’ Betsy” Slate. He would cluck. I would purr. I would cluck, and he would cut me off. We chattered and waited and chattered and waited. We carried on with our concert for a couple of “sets” of calling. Hank crawled over to the edge of the hill to see if any turkeys were down in the valley. I saw him scurrying back. He snatched up my decoys, and I knew what to do. I had to move. Below Hank spied two toms headed our way in full strut. In order to cut the distance we first had to double back and drop off to get a set up further down the hill. We high-tailed it and hid ourselves behind the juniper and sage. We paused and waited then called again. Then we heard multiple gobbles from atop the mesa where we had just been. I looked back again at Hank and gave him a “What the heck? !” look. They were getting closer, and Hank gave me the “Get ready. Here they come through the back door!” look. 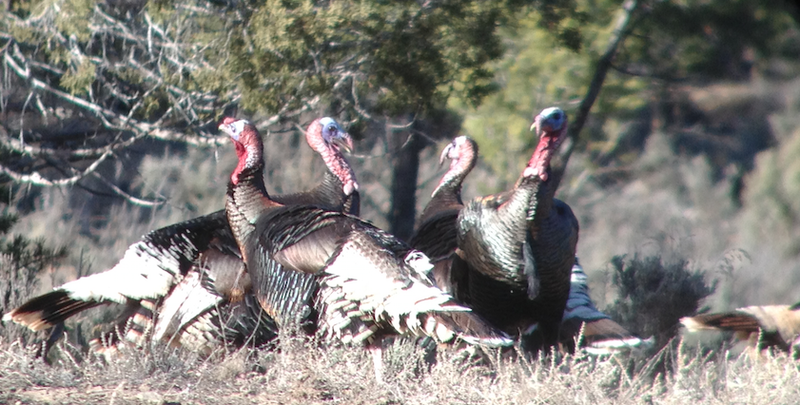 The gobblers at the top of the hill were coming faster than the two toms below. I slid my legs down the hill, careful not to knock loose any rocks, and rolled over to my belly so I could get a better view. I hid myself behind the root of the juniper and knew that Hank was going to be busted if the toms came in from the “back door”. I lay on my belly and then I saw them. Two blue heads peered over the top of the ridgeline. With Hank in between them and me, I signaled. “TWO.” Hank held still and steady. I watched as the toms made their appearance and started down the very trail Hank and I had used only moments ago. Then I saw MORE coming. What?! I made BIG eyes at Hank. Don’t lose your head – BE SAFE! He could see nothing of what was going on behind him and remained amazingly still. I signaled to him. FOUR! His eyes got big, and he mouthed “Can you shoot?” I signaled “NO WAY!” He had no idea, but the toms came down not five feet behind him. If I was going to get a safe shot at one, I was going to have to wait until they not only passed Hank, but also until they passed me. Once they got to Hank’s left side the tree I was hiding behind obstructed the turkeys’ view. I waited patiently. When the tree hid me, I drew my knees to my chest and paused. The decoys were directly to my right. I needed to pivot 180 degrees to be facing their direction. I waited until the tom was just to the decoys then pushed up on my toes, dug in on the steep hill, and pivoted. Pebbles began rolling down the hill. The tom stuck his head up in alert, and I got my shot. Sometimes the turkeys don't go by the playbook, so you've got to make a new play. Study, practice, be safe and best wishes to you for a successful turkey hunt too.